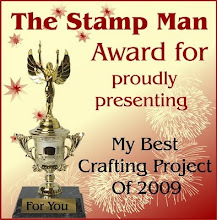 The Stamp Man: THE STAMP MAN CHRISTMAS BLOG CANDY NO.1!!! THE STAMP MAN CHRISTMAS BLOG CANDY NO.1!!! Ok, here's the first of the giveaways. We've used these 3 sheets designed by Kay Carley in 2 of our recent Create and Craft TV shows, you'll find card ideas in the labels section for them. There will be 3 winners for this prize. Each winner can pick ONE of the following unmounted stamp sheets from our own range for their prize, so, if you already have one of them, pick another to compliment the sheet you have! For those with blogs - to enter all you need to do is leave a comment below this post and spread the word on your blog by putting a picture of this blog candy onto your blog linking it back to this post. If you would like to sign up to become a follower that would be great as we'd really love you to follow our blog, but it is not a requirement, although becoming a follower will alert you to any Blog Candy updates! For those without blogs - please leave a comment below this post. Please note that you will need to leave your full name within the comment to be entered, anonymous entries cannot be accepted. This candy will run from today until midday GMT on Tuesday 15th December. The winners will be selected at random and announced later that day. As we will not have your contact details you will need to check back to see if you have won and contact us as soon as possible. If the prize has not been claimed by midnight GMT on Wednesday 16th December, a new winner will be drawn. Kay's stamps are fabulous, thanks for the chance to win a set. I am just off to post your candy on my blog! Wow this is lovely candy. I have seen you demonstrate these on C&C and they are fab. Personally I would love the flourishes because they have such a multitude of uses. I have bought the Funky frames set and what lovley lush stamps they are so thick and no messy mistakes with this set. I have also been to one of the classes in Skipton all the way from leeds and what fantastic value it was £20.00 for the whole of day plenty of materials to play with excellent teaching and free warm sandwich for all that wanted one. We must support local business unless we will lose them. Love all of these stamps so would be fab to win, already a follower & have put a link & a piccie on my blog. Hi Jill. These stamps are so gorgeous. I love my funky flowers. You are incredibly generous offering them as candy. I have put a link in my sidebar and shall be keeping everything crossed. THese stamps are just lovely....thank you for giving us a chance to win. WIll leave a link on my blog. Wow! Fantastic candy. Haven't got any of these stamps yet (they're on my Christmas wish list! )so I would LOVE to win the Funky Flowers. Thanks, Jill, for giving us the chance. Off to spread the word on my blog & crossing all my fingers! Wow what fab candy I love Kay Carleys designs. I have been wanting to get one/all of these but they are on my wishlist. I have put a link on my sidebar and thanks for the chance to win. Fingers crossed. Thank you! I've put a link in my sidebar, and I've got my fingers crossed. How beautiful are the stamp sets. Thanky ou for the chance tyo win one of them. These stamps are gorgeous, have watched a few times on C&C and Kay is just excellent. Thanks for the chance to win some. Love all of Kay's stamps, so popping over to my blog to post about your fantastic candy. I love these stamps and am so glad to have a chance! Woow Great candy!! Thanks for the chance to win! I post your candy in my blog! These stamps are just beautiful would love to win them so off I go to put the link up. Oh wow fab blog candy Jill. I'm new to the blogging world so will try my best to link it to my blog. Love Kay's stamps saw the C&C show and would love some of the new stamps. Fabulous show today ladies loved the stamps. Glad to see you back on TV Gill Also love the blog candy ones too. Such great stamps and thanks for the chance to win a sheet. Have become a follower and put a picture on my blog. Love the stamps, they are once again superb. What a clever designer. I am a follower but, as yet, do not have a blog. Great show today and what gorgeous blog candy - will advertise it on my blog. 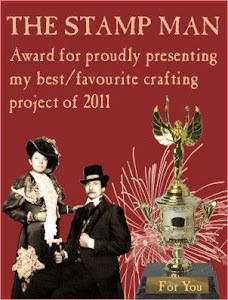 Hi there, I don't have a blog but I would love to have some of the wonderful stampman stamps - I have lots of the moonglow products to go with them! really great stamps! !thank you for the chance to win!!! i've linked you on my sidebar!! Thanks for the chance of winning, I love Kay's stamps. I would love the funky flowers as I already have the funky frames and flourishes. They are great to use. Come from Kays lovely blog, gorgeous stamps,pic link is on my side bar, thankyou for giving a giveaway! What a choice, great candy! Ive linked you on my sidebar and am crossing my fingers! I put a post up on my blog....here. I just love these stamps!!!! They are so brillant!!! Hi I am a follower, with a blog, but don't know how to link the blog candy - shall learn one of these days. I love Kay's designs and particularly like those flourishes. I'm so glad I found this great blog and your very generous giveaway! Thanks so much! I just became a follower and I'm off to post your candy on my blog! Its my first time on this blog but I have bookmarked it as you have some great ideas. Just love the fairy wings. Thank's for the chance of one of Kay's lovely stamp set's. Great stamps! Thank you so much for the chance to win! Fabulous stamps. Thanks so much for the chance of winning one set. Count me in! I've added this pic and link to my sidebar and I'd love to win one of these, ANY one of these would be great! I HAVE WATCHED DEMO'S OF THESE ON C+C THEY ARE SO VERSATILE AND STUNNING WHEN MADE UP. Ooh luvverly! Can I play too please, sounds like fun, and the stamps are gorgeous! Will post on my blog later today! Kay's stamps are wonderful, I don't have any of her stamps and would love any of these. Thank you for the opportunity to win these stamps. I am now going to post you on my blog. i love the flourishes because it can be incorporate into all kind of crafting. Wow what a candy offer thanks for the chance to join in. I have linked you on my sdiebar. I so wish I had seen the show where these beautidul stamps were demo'ed but have only recently had access to Create and Craft. Hope the show is repeated. Love your stamps! I already have several sets! I became one of you're followers and I've put you're candy into the sidebar of my blog! I'll come visiting you're blog more times in the future. Would love to give one of these sets a new home. thanks for chance to win. I've linked you in my sidebar. Hi! I have your candy on my sidebar and I am a follower. Thank you so much for this chance to win. Ooh, a great giveaway, Jill :) I've uploaded the photo and linked back to this post. Best of luck. What gorgeous stamps - you are so generous, I would love to be entered into you draw please. I have uploaded the photo with a link back - and am a follower too. it would be wonderful to win these stamps .thanks for the chance to win. I'd love to win a set of the Funky Flowers for myself :) I've linked you up on my sidebar. Thanks for the chance. Wow what wonderful blog candy I love Kays stamps they are all lovely. I would be pleased to win any set. Thank you for the chance to win. I never win anything, but fingers crossed. Wow! What a gorgeous prize. Love Kay's stamps. Please do count me in. I'm a follower now too so as not to miss any more of your fab work . Lovely stamps - thanks for the opportunity to win something. Loved these stamps when I saw them on C&C I would love to win a set. Love all Kay's work and the funky flowers are just great, would really love to design some cards with these stamps. 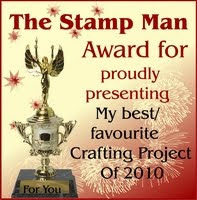 I love Kays stamps, I wouild love to win these. Happy Christmas. What lovely stamps. Thanks for the chance to win such super Candy. I've put a link in my sidebar. Thanks for the chance to win these beautiful stamps. I have the funky flowers and absolutley adore them. Love all your stamps! Thanks for the chance to win. I'm already a follower and just posted your candy in my sidebar! WOW - thanks for the chance of winning some of your stamps! I'm off to become a follower, and post in my sidebar! Love these stamps, and would love to win some! Really generous of you to offer them. Wow what great candy. watch the demos on CC and loved the stamps. I am a new blogger so don't really know how it all works but am learning lol. Thank you for the chance to win this fabulous candy. I've put your candy picture with the link in my sidebar . Awesome blog candy! Thanks for the chance to win! I have posted your blog candy in the sidebar of my blog and I have become a follower! Thanks for such fab blog candy, I have the flower set and they are brilliant and would love a chance to have another set in my crafty mits, sorry no blog, seriously thinking about trying to do one in the new year. What a very nice candy great stamps. cross my fingers for this candy. Hi i am really exicited to be able to also hop - i am honest , do not have the stamp's as i am a novice to stamping , but would love some candy to get familiar with it !!! I do not have a blog , sorry ! NEW Create & Craft Show Today at Noon! New Create and Craft show on Saturday at noon! Just a note with Classical Instruments!